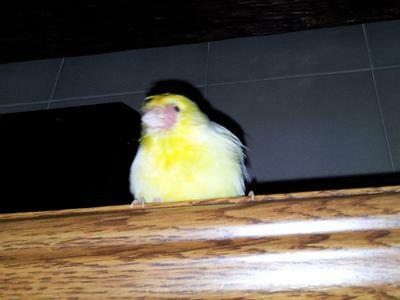 Hi, I have been a Canary owner for the past two years. He is normally a very cheerful canary and he's normally out of his cage going around in the kitchen (as the pic can show). For the past two weeks I've noticed that he's itching his beak frequently and this resulted in losing the feathers around his beak. Now the situation seems to be getting worse as it's affecting the area close to his eyes. For the past two days I've put some olive oil on a cotton swab just in case the itching is coming from the mites. I'm really doing my best to see that's he's resting and eating. I appreciate if anyone here has any other opinion what this might be and how I can treat him asap please. Many thanks. All a mirror does in the canary cage is create stress and often silence in canaries...and sometimes an attempt at fighting or mating with the mirror. Hello I have been playing your ' singing canary training ' on YouTube. I have only had her for a month and she was about two months old . She is a content and sociable little thing. After playing the canary singing for the first few times she was so exited.Today I have noticed that she is just staring into her mirror and not spending as much time out of her cage. She is is still alert when I talk to her but she is knocking her beak on her perch. I haven't seen her do this before. Should I stop playing the YouTube clips of canaries singing? I just want to be sure she's not sad.